Making your own bridal bouquet doesn’t need to be difficult! 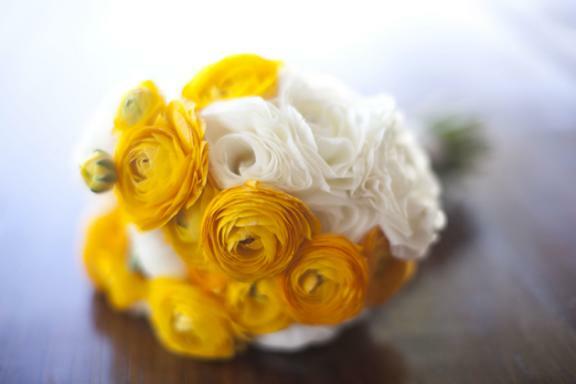 Kelly Oshiro, wedding planner and stylist of Santa Barbara Chic, shows us just how easy it can be with her white and yellow ranunculus bouquet. Ranunculus have a multitude of paper thin petals that slowly unfurl into a sensational bowl shaped bloom, making this a soft and romantic flower. Bunch together stems of one or two colors, then wrap the stems with a simple ribbon, and you have a beautiful, lush bouquet! Known to some as Persian Buttercup or Coyote’s Eyes, this flower symbolizes radiance and conveys, “I am dazzled by your charm and attraction.” Ranunculus would be a great addition to any bouquet, centerpiece or arrangement!